Last Updated: July 3, 2018 | Subscribe to our weekly newsletter! Before you sink into despair when you notice algae in your pool turned your backyard into the Swamp of Sorrows, stop yourself and suit up to take action. But don’t worry. Killing and then preventing the development of algae in your salt water pool isn’t as daunting as it may seem, as long as you act aggressively. Just don’t wait around. That algae can grow out of control in no time, making algae removal even more difficult. By following a few simple steps, applying some elbow grease, and putting some chemicals and equipment to good use, you can destroy that algae bloom by tomorrow and keep it from coming back. How Did You Get Algae in Your Salt Water Pool? One day your pool is crystal clear. The next, it looks … different. Your once-sparkling pool is now milky, green, mustard-yellow, or even black. It looks like a swamp monster will come crawling out of there any minute. What the heck happened, and how did this muck get into your pool? Pool algae comes from some surprising sources—like you and your family. Really. Swimmers can carry algae spores in their bathing suits from other places they went swimming. It may also stick to pool floats, swim vests, even your pool cleaning equipment. Have you ever felt little slimy patches on your floats? That could be the start of your next algae bloom. Before you can treat them effectively, you need to know the different types of algae, and common algae imposters. If you don’t treat it aggressively enough, you’ll wind up with a rebound algae bloom in no time. And, of course, more swamp monsters. Chlorophyta is a cyanobacteria that gets its green color from chlorophyll, the chemical that lends its familiar hue to all green plants. Green algae reproduce in every manner a chlorophyta possibly can, which can be explained with lots of sciencey words. The takeaway is that it’s a problem that multiplies rapidly in your pool, especially when you don’t have enough free chlorine in the water. Your pool may turn from a bit cloudy to an obvious green color in one day. It’s commonly called mustard algae, but you definitely don’t want to put this stuff on a hot dog. You’ll know you have yellow algae if you see debris that looks like pollen or clumpy sand gathered in the corners and on the floor of your pool. This is another type of cyanobacteria, but this black version is not true algae. It appears as black spots along rough surfaces inside your pool. Although it may seem innocuous at first, don’t be fooled. So-called black algae digs its roots deep into your pool walls, making it incredibly resistant to chlorine. You may not realize that pink sludge collecting around your pool components is not actually algae, but a bacteria. No one wants to swim in bacterial soup, so as soon as you see pink slime forming, you must act quickly to treat it. If you’re new to caring for a salt water pool, you may not know the water is actually chlorinated. In fact, it has (ideally) the same amount of free chlorine as any regular pool. The difference lies in how the sanitizer is administered to your pool water. With a salt water system, you put salt into your pool If you click this link and make a purchase, we earn a commission at no additional cost to you. instead of chlorine. 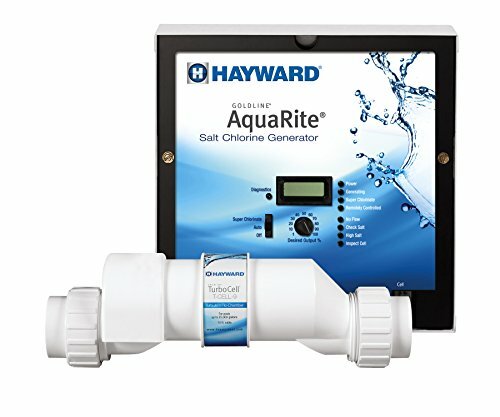 Your salt water chlorinator then zaps (super-technical term) the saline solution (salty water), turning the salt into hypochlorous acid (HClO) and sodium hypochlorite (NaClO), the compound commonly known as chlorine. Because the electrolysis (zapping) process occurs as the salt water passes through the chlorinator, the chlorine is added slowly and steadily around the clock. Your chlorinator won’t ever provide a massive dose of pure chlorine to your pool all at once, so the water is softer and gentler If you click this link and make a purchase, we earn a commission at no additional cost to you. for swimmers’ skin, hair, and eyes. The downside is it can also make it easier for algae to grow if you let your pool chemistry slip even a little. Most salt water chlorinators have the option to boost chlorine output to 100 percent for 24 hours. Doing so increases the chlorine output, immediately raising the free chlorine concentration in your pool water. This mode is meant to be used whenever your pool experiences a heavy bather load (lots of swimmers), rain increases the water volume, you’ve added more water after evaporation, or your water is just looking a little cloudy. 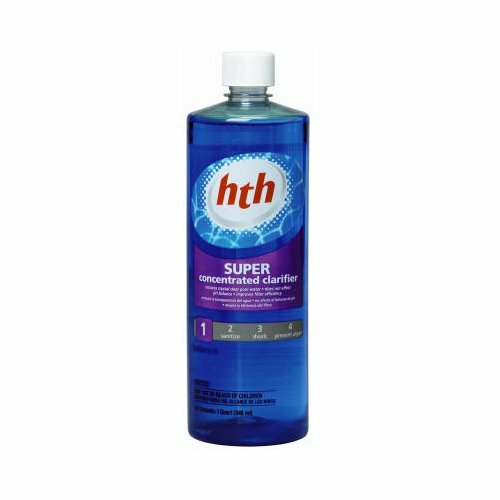 You’ll also super chlorinate weekly, just as you would add shock to a regular chlorine pool to eliminate chloramines and bather-introduced contaminants. But the boost mode isn’t strong enough to address algae problems. Because your chlorinator’s boost mode can’t deliver the goods, you’ve got to do the work yourself with some standard pool equipment and chemicals you should have on hand at all times. 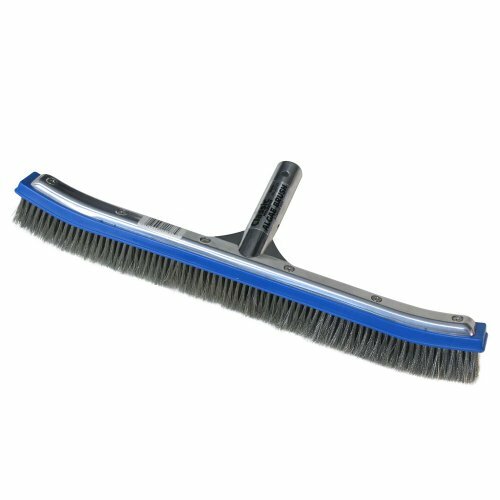 Using an algae brush If you click this link and make a purchase, we earn a commission at no additional cost to you. , scrub as much of your pool walls and floor as you can reach. The more algae you can free from the walls, the better. Any residue can be better treated by the chlorine after you’ve scrubbed off the top layers. Manually vacuum your pool If you click this link and make a purchase, we earn a commission at no additional cost to you. , being as thorough as possible. All that algae debris is floating around, waiting to be sucked out. Be sure to vacuum to waste, if you can, so you’re not sending the algae right back into your pool. You may need to add some water to your pool afterward to get it back up to the ideal level. … to keep your balance, you must keep testing your pool water. Wait, is that the right quote? Regardless, test and balance your pool water after vacuuming. 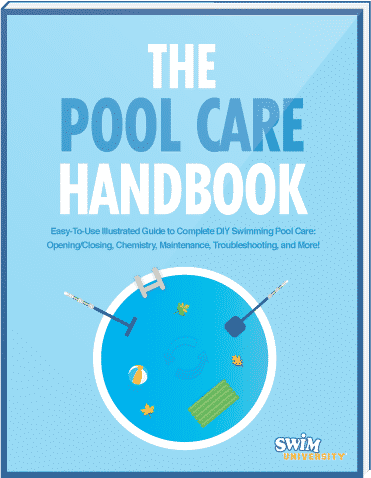 You’ll want to get the pH and alkalinity just right before you add that mega-dose of chlorine. Just a little green algae: Double the usual shock treatment. A lot of dark green algae: Triple shock. Mustard algae: This stuff can withstand a lot of chlorine, so triple shock to kill it all the way dead. Black algae: This one’s really hard to kill. Quadruple shock. Pink slime: Remember, it’s bacteria, not really algae, so treat it like you’d treat any bacterial problem: quadruple shock. 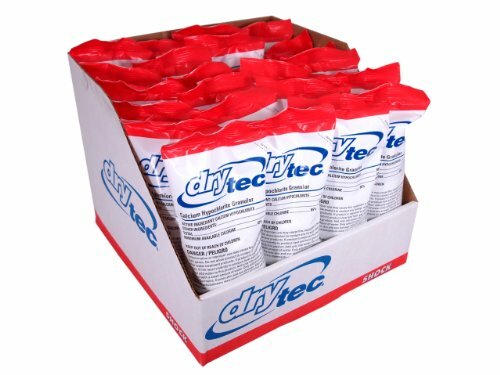 Note: Use calcium hypochlorite shock If you click this link and make a purchase, we earn a commission at no additional cost to you. 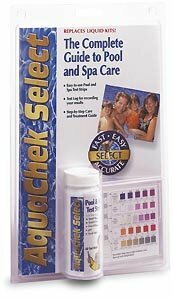 to safely shock the algae in your salt water pool into oblivion without adding unnecessary chemicals to the water. The high dose of chlorine and dead algae spores suspended in your water will make it look really cloudy right after shocking. That’s completely normal. Fortunately, you don’t have skim all of it out by hand. Run your filtration system overnight (or for at least eight hours) until your pool water isn’t cloudy anymore. If your water is still cloudy after eight hours of filtering, you can add a dose of pool water clarifier If you click this link and make a purchase, we earn a commission at no additional cost to you. , then continue running the filter until the water clears. Now your water looks great, but you need to make sure the sanitizer levels have returned to a safe level before anyone dives in. Grab your test strips If you click this link and make a purchase, we earn a commission at no additional cost to you. and check it out. If your water chemistry needs any tweaking at all, do it now. 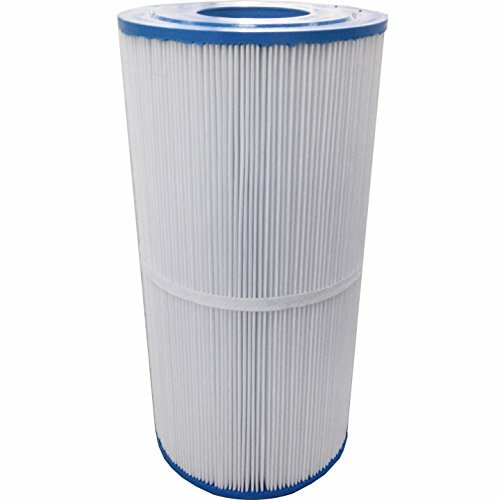 Your filter has been working overtime to get rid of algae spores. 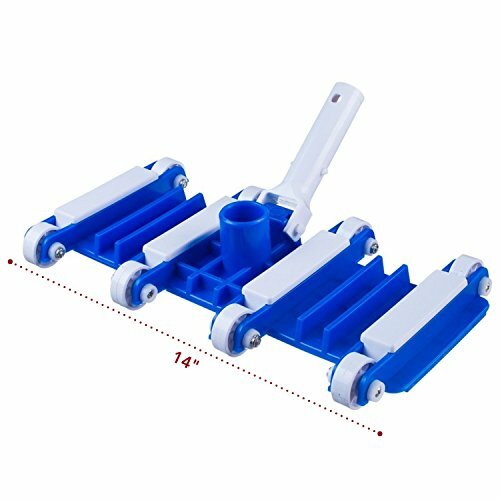 Just to be sure it doesn’t allow any old algae to wash back through your return lines, take it out and deep clean it with muriatic acid If you click this link and make a purchase, we earn a commission at no additional cost to you. . Better yet, whether it’s near time for a filter replacement or not, install a new one If you click this link and make a purchase, we earn a commission at no additional cost to you. . If you use a diatomaceous earth or sand filter, you’ll need to backwash to waste, then determine whether it’s time to replace your filter medium. Now? Yes. After you’ve successfully killed all the algae is the best time to use algaecide If you click this link and make a purchase, we earn a commission at no additional cost to you. . This additive is really best used as a prevention measure, not a treatment for blooms. You can use maintenance doses of algaecide as part of your regular water care routine, too. Just be sure your chlorine is below 5 parts per million (ppm) before adding algaecide. In addition to using an algaecide as part of your water care routine, you can do a few more things to help prevent the growth of algae in your salt water pool. Shower before getting in the pool to help remove any residual algae spores on swimwear. Showers also limit swimmer-introduced contaminants such as lotions and shampoos, which cause your sanitizer to work overtime, limiting its ability to kill any algae that finds its way to your pool. Wash swimsuits after every use to remove algae spores, especially if you’ve been in a public pool or natural body of water which is more likely to have algae spores. If you’ve only been swimming at home, a good rinse between swims should be sufficient. Clean pool toys and equipment between uses. 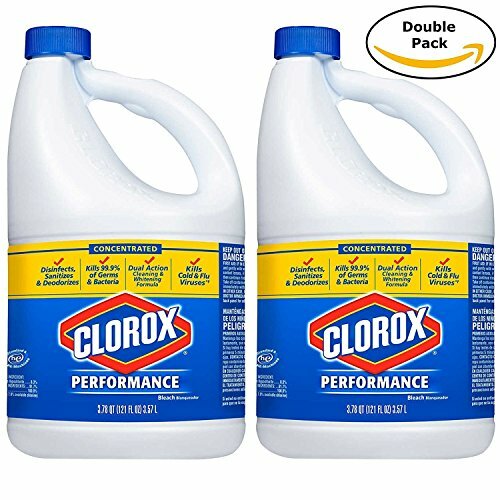 You can wipe down floats and other pool items with diluted bleach If you click this link and make a purchase, we earn a commission at no additional cost to you. to kill algae spores and mildew. Rinse well so the bleach doesn’t degrade the integrity of your floats. Balance your water chemistry weekly. We can’t overstate how important this is. Use your chlorinator’s boost mode weekly (or more often if needed) to keep free chlorine levels where they should be. If your pool is being used heavily, it’s not overkill to test the water every afternoon or evening, then use boost overnight if needed. If you thought you wouldn’t have any water problems with a salt water pool, you’re not alone. Unfortunately, despite the many positive aspects of salt water pool ownership, they’re not naturally resistant to algae. 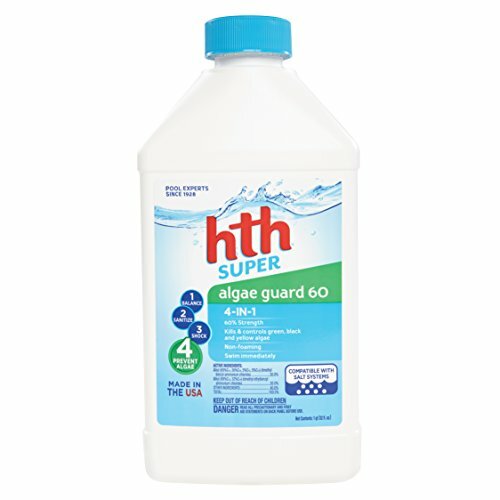 Now that you’re armed with the best methods for killing that algae, act swiftly to stop it in its tracks. Keep it from coming back with algaecide and good prevention practices, and you won’t have to worry about those swamp monsters ruining your backyard fun.